From left: Lisa M. Deeley, Chairman Anthony Clark and Al Schmidt. 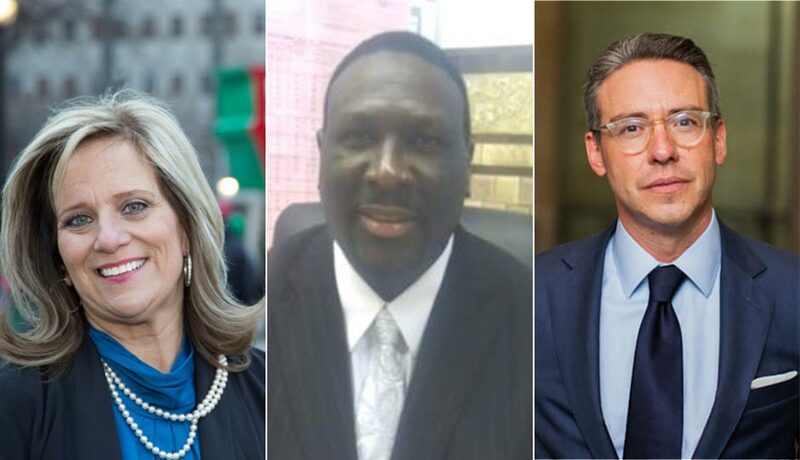 A new coalition of Philadelphia civic groups is calling for an end to the City Commissioners, the elected trio of officials that runs the city’s elections, and the creation of a new Department of Elections with leadership appointed by the mayor. At a press conference Wednesday morning, the coalition called on City Council to sponsor an amendment to the Home Rule Charter that would enact the change. The coalition includes some predictable organizations like the civic watchdog Committee of Seventy, the urbanist 5th Square PAC, and Philadelphia 3.0, a PAC that’s focused mostly on shaking up City Council itself. But it also includes groups like Disability Rights PA, Asian Americans United, the Public Interest Law Center, and the Southeast Asian Mutual Assistance Coalition (SEAMAAC). The initiative isn’t just about ousting no-show City Commissioner Chairman Anthony Clark, said Ali Perelman of Philadelphia 3.0. It’s about improving language access and disability access at the polls, modernizing elections, and boosting voter turnout. And it’s not just about helping people vote, but allowing them to vote independently and in private. Suzanne Erb, a blind woman who works as a secretary at Disability Rights PA, said she had to wait an hour and a half to cast her vote in private this past primary election day. The poll workers hadn’t been adequately trained to know how to quickly set up the machine for the blind and visually impaired, she said. Wei Chen of Asian Americans United said poll workers also weren’t trained well enough to work with voters who speak limited english. More voices have been calling for the abolition of the City Commissioners’ office lately, including former Councilwoman Marian Tasco, who served as a Commissioner in the 1980s and says she “had nothing to do” at the time. The Better Philadelphia Elections Coalition says it landed on its remedy — an appointed Director of Elections with an appointed, bipartisan, unpaid board of elections — after researching the election operations of other cities. Why would an appointed board be an improvement over an elected board, one reporter asked. Thornburgh’s answer revealed the depth of the city’s perceived disengagement with electoral politics. The city would “gain accountability” with an appointed board over an elected one, Thornburgh said. In that view, allowing the mayor to fire someone if elections go awry is a greater level of accountability than allowing the voters to not re-elect that person. Which may be true. After being presented with evidence that Commissioner Clark has a spotty voting record and barely showed up to the office, the local Democratic Party endorsed his campaign and voters re-elected him comfortably. No members of City Council attended the press conference, but Thornburgh said the coalition is having private conversations with certain members. The coalition expects its membership to grow.